Measure the mass(%) of total sulfur in crude petroleum, petroleum, heavy oil, diesel oil, gasoline and naphtha; to test total sulfur content in products of coal chemical industry, for instance primary benzene; to test total sulfur or sulfide in other liquids or solid power samples. Conforms to ASTM D4294 and related specifications. 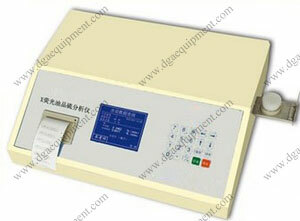 Sale and reliable X-Ray protection measure. Sample testing: Single-sample tested automatically; Testing times(2, 3, 5, 10 and 50 times) set at random; average value and standard deviation presented after test.